We’d spent the day hiking and swimming together with our newlywed friends, and came home ready for an easy and delicious meal. That was the first night I’d had these Hawaiian steak kebabs and boy did they leave an impression! This is the perfect meal for those full days where you’ve been busy, but have a hungry crowd to feed. Thanks to my friend the hostess, all the veggies were prepped and the meat had been marinating all day. Once we got home, everyone worked together to thread the food onto skewers, while a few of the guys went out back to fire up the grill. We cooked some rice and cut up a watermelon to round out the meal- it was incredibly satisfying! Looking back on that dinner years later, I can vividly remember the good laughs and good friends we enjoyed– all centered around preparing and eating this good meal. The meat needs to marinate for at least 3 hours, but you can cut it up and throw it in a bag with the marinade in the morning to have it ready that night. The rest of the ingredients can be chopped into similar, bite-sized portions well ahead, so you’re ready once it’s go time. Remember to use either metal skewers or soak wooden skewers for 30 minutes before threading, so they don’t burn up on the grill! 1. Cut the steak into 1½ inch cubes and place in a Ziplock bag. 2. Pour the teriyaki sauce/marinade over top and turn until meat is covered. 3. Store in the fridge for 3+ hours. 4. Chop the peppers and red onion into large squares. 5. Cut the pineapple into 1½ inch wedges. 6. Combine peppers, onion and pineapple in a large mixing bowl and toss with olive oil and season to taste with salt and pepper. 7. When the meat is ready, throw away leftover marinade. 8. At least thirty minutes before threading, soak wooden skewers in water. 9. 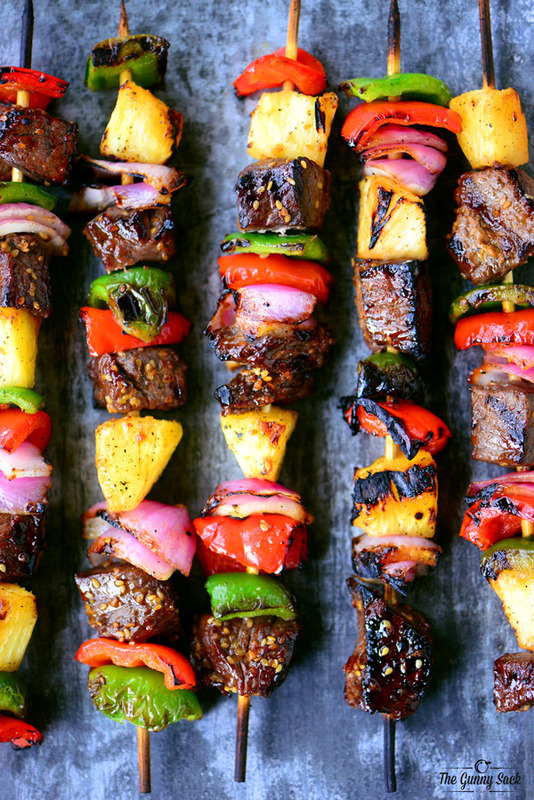 Thread all food on skewers, alternating each ingredient. 10. Prepare the grill for direct cooking over medium-high heat. 11. Cook the kebabs until veggies are tender and meat is at 145 degrees. 12. 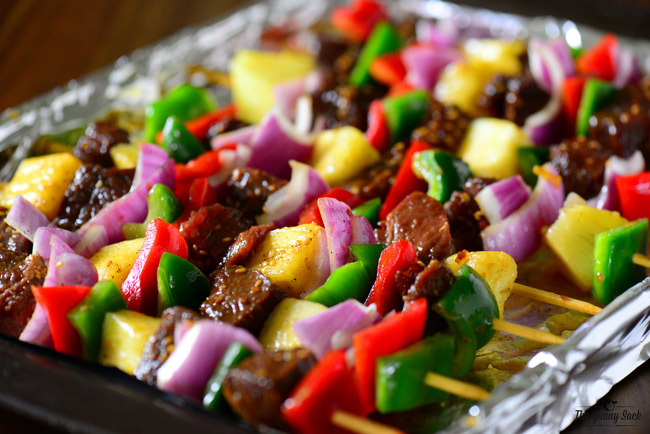 Baste with extra teriyaki sauce throughout cooking process and turn skewers occasionally. Let me know in the comments if you try out this recipe—I’m sure you’ll love it!